The eruption occurred just before the 1815 Tambora volcanic eruption, which is famous for its overwhelming impact on climate worldwide, with 1816 given memorable names such as ’Eighteen-Hundred-and-Froze-to-Death’, the ‘Year of the Beggar’ and the ‘Year Without a Summer’ due to unseasonal frosts, crop failure and famine across Europe and North America. The extraordinary conditions are considered to have inspired literary works such Byron’s ‘Darkness’ and Mary Shelley’s ‘Frankenstein’. However, the global deterioration of the 1810s into the coldest decade in the last 500 years began six years earlier, with another large eruption. 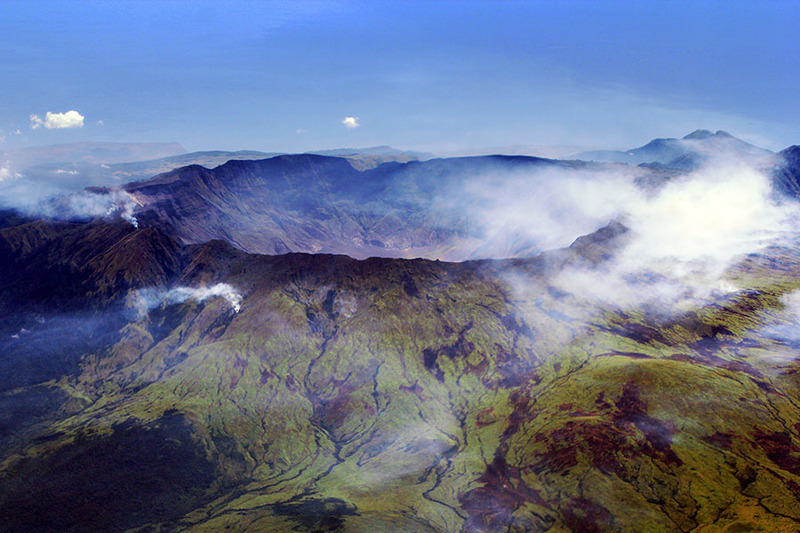 In contrast to Tambora, this so-called ‘Unknown’ eruption apparently occurred unnoticed, with both its location and date a mystery. In fact, the ‘Unknown’ eruption was only recognized in the 1990s, from tell-tale markers in Greenland and Antarctic ice that record the rare events when volcanic aerosols are so violently erupted that they reach the Earth’s stratosphere. Working in collaboration with colleagues from the School of Earth Sciences and PhD student Alvaro Guevara-Murua and Dr. Caroline Williams, from the department of Hispanic, Portuguese and Latin America Studies, began searching historical archives for references of the event. In February 1809 Caldas wrote about a “mystery” that included a constant, stratospheric “transparent cloud that obstructs the sun’s brilliance” over Bogotá, beginning on the 11th December 1808 and seen across Colombia. He gave detailed observations, for example that the “natural fiery colour [of the sun] has changed to that of silver, so much so that many have mistaken it for the moon”; and that weather was unseasonably cold, the fields covered with ice and the crops damaged by frost. Unveiling a short account written by physician José Hipólito Unanue in Lima, Peru, describing sunset after-glows (a common atmospheric effect caused by volcanic aerosols in the stratosphere) at the same time as Caldas’ “vapours above the horizon”, allowed the researchers to verify that the atmospheric effects of the eruption were seen at the same time on both sides of the equator. These two 19th century Latin American scientists provide the first direct observations that can be linked to the ‘Unknown’ eruption. More importantly, the accounts date the eruption to within two weeks of 4th December 1808. One last question still remains: why are there so few historical accounts of what was clearly a significant event with wide-reaching consequences? Perhaps, Dr. Williams suggests, the political environment on both sides of the Atlantic at the onset of the nineteenth century played a part. “The eruption coincided with the Napoleonic Wars in Europe, the Peninsular War in Spain, and with political developments in Latin America that would soon lead to the independence of almost all of Spain’s American colonies. It’s possible that, in Europe and Latin America at least, the attention of individuals who might otherwise have provided us with a record of unusual meteorological or atmospheric effects simply turned to military and political matters instead,” she said.